Gold futures moved lower on Monday, marking their first loss in three sessions as the U.S. dollar firmed. Gold for December delivery declined $8.20, or 0.7%, to settle at $1,227.60 an ounce on the Comex division of the New York Mercantile Exchange. The close is the weakest in a week. 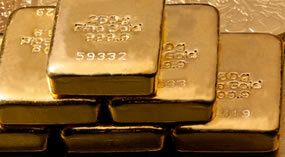 "Gold is now increasingly in need of supporting fundamentals to carry it higher. This after the tailwind from short covering begins to fade given the sharp reduction witnessed during the past few weeks," Reuters quoted Saxo Bank analyst Ole Hansen. Gold futures ranged from a low of $1,226.10 to a high of $1,237.60. They rose 0.6% last week for their fourth straight weekly increase. Silver for December delivery dropped 25.8 cents, or 1.8%, to settle at $14.442 an ounce. Silver futures traded between $14.40 and $14.78. They rose 0.3% last week. January platinum rose $2.50, or 0.3%, to $836.90 an ounce, ranging from $833.50 to $845.60. Palladium for December delivery fell $6.60, or 0.6%, to $1,079.30 an ounce, trading between $1,077.10 and $1,106.80. Last Tuesday, they ended at $1,122.80 an ounce to score an all-time record. The two divided last week with platinum slipping 0.2% and palladium gaining 1.5%. Gold declined $3.05, or 0.3%, to 1,230.80 an ounce. Silver shed 4 cents, or 0.3%, to $14.65 an ounce. In LBMA results last week, platinum declined 1.2% while the other metal prices advanced — 0.5% for both gold and silver, and 0.6% for palladium.